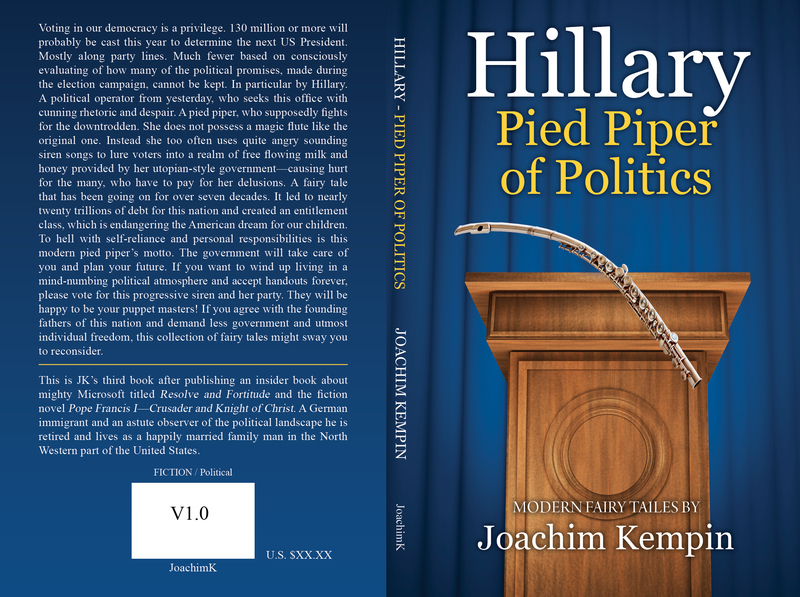 Joachim Kempin is self-publishing a book with Outskirts Press, and he wants your help deciding on his book cover. Voting in our democracy is a privilege. 130 million or more will probably be cast this year to determine the next US President. Mostly along party lines. Much fewer based on consciously evaluating of how many of the political promises, made during the election campaign, cannot be kept. In particular by Hillary. A political operator from yesterday, who seeks this office with cunning rhetoric and despair. A pied piper, who supposedly fights for the downtrodden. She does not possess a magic flute like the original one. Instead she too often uses quite angry sounding siren songs to lure voters into a realm of free flowing milk and honey provided by her utopian-style government—causing hurt for the many, who have to pay for her delusions. A fairy tale that has been going on for over seven decades. It led to nearly twenty trillions of debt for this nation and created an entitlement class, which is endangering the American dream for our children. To hell with self-reliance and personal responsibilities is this modern pied piper’s motto. The government will take care of you and plan your future. If you want to wind up living in a mind-numbing political atmosphere and accept handouts forever, please vote for this progressive siren and her party. They will be happy to be your puppet masters! If you agree with the founding fathers of this nation and demand less government and utmost individual freedom, this collection of fairy tales might sway you to reconsider. This is JK’s third book after publishing an insider book about mighty Microsoft titled Resolve and Fortitude and the fiction novel Pope Francis I—Crusader and Knight of Christ. 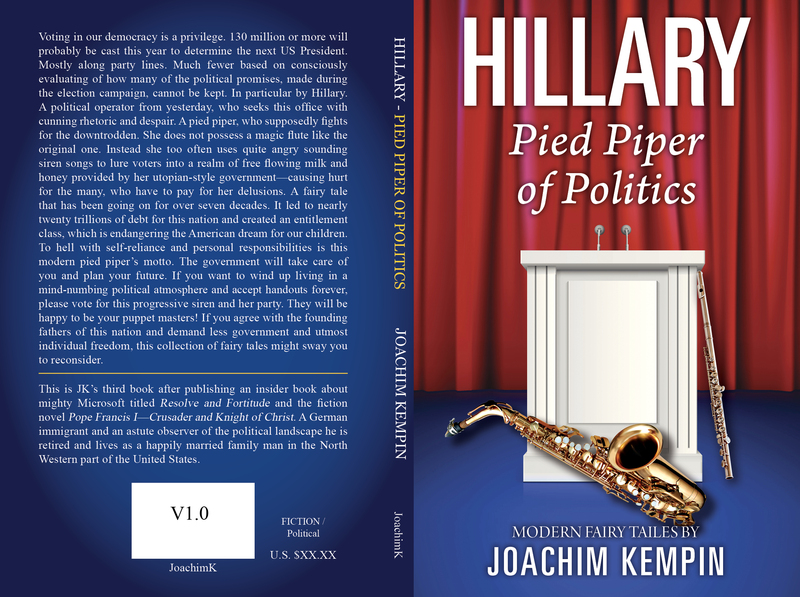 A German immigrant and an astute observer of the political landscape he is retired and lives as a happily married family man in the North Western part of the United States. Please take a look at two possible covers below and then vote on the choice you recommend for JK.